Rabbits have a complex digestive system, which requires them to have constant access to food, particularly high quality hay and water. A rabbit who stops eating or drinking or who does not drink enough can go into gastrointestinal stasis, or ileus, a life-threatening condition that can result in death in as little as 24 hours. However, you can encourage your rabbit to drink in several simple ways. Water Bowl or Sipper Bottle? Rabbits generally drink more water from a bowl. However, whether you use a water bowl or a sipper bottle really depends on your rabbit's preferences. You may want to offer both a water bowl and a sipper bottle. Rabbits can learn to use a water bottle with coaxing. Smear a small bit of banana onto the sipper to encourage your rabbit to drink. Wipe the uneaten bits of banana off to avoid rotting. Once your rabbit uses the sipper bottle on his own, stop applying the banana. Opt for a sipper bottle that has a metal, rather than a plastic, sipping mechanism. Rabbits have sharp teeth that can damage the plastic. Give your rabbit fresh water daily to encourage drinking. Wash your rabbit's drinking apparatus daily with hot water and a gentle detergent to prevent the growth of bacteria. Thoroughly rinse the detergent from the bowl or sipper bottle before filling with fresh water. Give your rabbit fresh, leafy greens, such as romaine lettuce, each day to help with water intake. The general rule is for every 5 pounds your rabbit weighs, offer a minimum of 4 cups of fresh, leafy greens. Rinse the greens and serve them wet to help with water intake. If your rabbit refuses to eat or to drink, which may indicate an illness or the start of ileus, consult a veterinarian immediately. 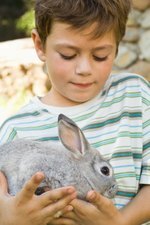 A veterinarian may instruct you to give your rabbit water or unsweetened Pedialyte by syringe and will tell you how often and how much to give. Gently put the syringe into your rabbit's mouth behind the incisors. Slowly release the syringe, holding it sideways to prevent the water from going into your rabbit's trachea. Allow your rabbit sufficient time to swallow the water or, if giving food, to chew then swallow.